Due to increased operating demands in regional areas, the Water Corporation called for quotes for the construction of 6 x new temporary offices in various locations. Modular WA provided the most economical and efficient proposal and was awarded the project in July 2018. Construction, transportation and installation of six (6) modular offices to various locations across Western Australia. Each modular office features a verandah and deck, with an open plan office space and kitchenette. The design also incorporates a unisex universal access bathroom with toilet and shower amenities. Modular WA provided the client with an effective and economical off site construction solution. The separate universal access toilet included grab rails and suitable amenities as per AS.1429. The modules were constructed with full fit out at our manufacturing facility in Wangara before being transported to site, or to the client’s nominated holding facility. With a total construction time of just 7 weeks in the yard, Modular WA delivered an excellent, rapidly-built product in line with the client’s timeline requirements. The Shire of Yalgoo is located approximately 500km north of Perth in the Mid West. In early 2018 Modular WA was awarded a contract for the design and construction of a new multi-purpose sports facility that would service the town’s new sporting grounds and rifle range. The project included the design, construction, transportation and site installation of a six module multi-purpose sports facility including completion of onsite external structures. The facility features a sprawling multi-purpose area complete with kiosk kitchen, bar, store and equipment rooms as well as two sports changerooms and accessible bathrooms. Surrounded on three sides by an expansive undercover area, the building provides functional, attractive spaces perfect for a variety of community events. In order to invigorate the town and encourage community engagement, the client requested a building that would make an aesthetic statement. Modular WA’s design team worked closely with the client to produce a stunning solution that incorporated corrugated steel, timber columns and copper accents. This along with commissioned LED-lit artwork made testament to the surrounding Western Australian outback. As the Shire of Yalgoo is considerably isolated, exceptional scheduling and coordination of onsite contractors was required to ensure the project was completed without delay. Despite working over the most challenging summer months, Modular WA’s site installation team delivered the project ahead of schedule to a satisfied client. Being one of the fastest growing local governments in Australia, the City of Wanneroo welcomes around 8,000+ new residents each year. As part of the multi-million dollar Yanchep-Two Rocks infrastructure upgrades, the City of Wanneroo called upon tenders for a new emergency services building which was then awarded to Modular WA. Design, construct and install a new emergency services building for the Two Rocks Fire Station. Double sliding doors open into an expansive meeting room, providing a much needed training space for the Two Rocks Emergency Services team. As well as a kitchenette, the building was fitted out with a universal access toilet and male & female change room facilities. Modular WA provided the client with an effective solution to their requirements for an accessible building. The finished floor level was kept as low as possible so that entry points were wheelchair accessible, while the separate universal access toilet was fitted out with grab rails and amenities as per AS.1429. The modules were constructed off site at our manufacturing facilities before being transported to site. With a total construction time of 10 weeks in the yard and 2 weeks installation onsite, Modular WA delivered an excellent, rapidly-built product whilst ensuring site disruption was kept to a minimum. Jurien Bay Village offers resort style living with superb facilities for over 50’s. Assisted by funding from Royalties for Regions, the village services the growing aged population in the regional community. Design, construct and install full turnkey lifestyle units and respite centre to Jurien Bay Village. Includes transport, cranage and site install of all units as well as custom design consultation and sales support. The village offers six different two and three bedroom designs showcasing contemporary interiors. All designs intend to accommodate the modern, coastal lifestyle whilst being fitted with accessible solutions where required to ensure maximum security and comfort. Constructing homes for an estate calls for precision planning due to the restrictions faced when installing modules onto tightly fit blocks. Modular WA works extensively with our expert transport and logistics specialists so that installations are carried out ensuring maximum cost efficiency and minimal disruption to the site. Adhering to our client’s strict timeline requirements, our homes are rapidly built and transported to site in just 12 weeks. This demonstrates that Modular WA has the resources and expertise to deliver a high quality product, on time and within budget. Margaret River Independent School awarded Modular WA the tender for the construction and installation of two modular classrooms to accommodate the school’s growing student population. Construct and install two modular classrooms for the Margaret River Independent school. Includes transport of modules, onsite traffic management, cranage and site installation. The classrooms were fully fitted out including features such as ceiling mounted projectors and white boards, with the external colour scheme matched to the existing school buildings to ensure seamless, harmonious integration. This particular project was far more challenging than the typical modular install, with restricted access to the area and a particularly short site-access availability window of 1 week. Due to the position of the site, the buildings had to be reversed off Bussel Highway during the peak school holiday period and required a full traffic management plan. The trees surrounding the area and tight install space called for precise maneuvering of both the crane and building modules. Due to the limited timeframe the entire install and complexing process had to run extremely smoothly in order for us to achieve the client’s strict handover deadline. In 2018, Modular WA was successfully awarded the tender for the supply and installation of five staff houses for the Shire of Wiluna. The township of Wiluna is located in the North-Eastern Goldfields of Western Australia, approximately 800 kilometres from Perth. The staff housing will be used by the Shire of Wiluna to accommodate a number of permanent employees in housing that is specifically designed for the harsh environment in this remote region of Western Australia. The project included the custom design, construction, transportation and site installation of the 5 homes. 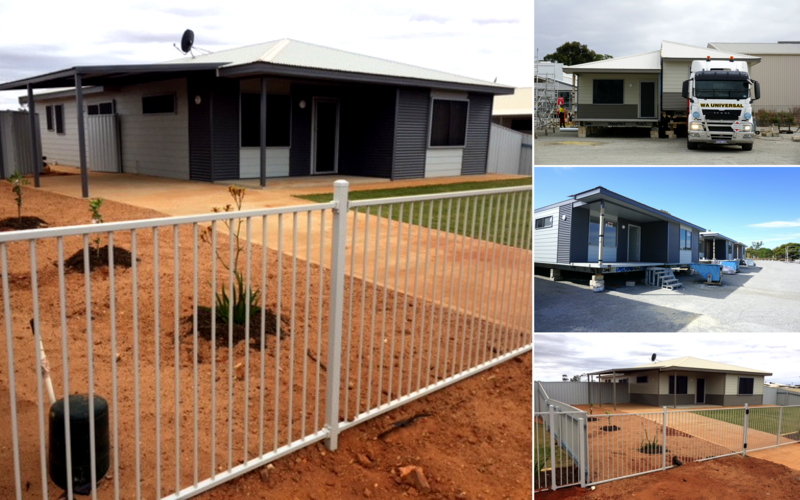 Work on site in Wiluna included earthworks, service connections, concrete paths and driveways, site built carports, fencing and landscaping. The 3 bedroom 2 bathroom homes showcase modern interiors and functional spaces. The home design and construction used materials and fixtures that will help ensure they are easy to maintain. This included the selection of external wall and roof cladding materials and colours that suit the harsh environment of the North-Eastern Goldfields. The main bathroom of each home includes design features to improve access and external doors and windows were fitted with security screens to provide maximum security and comfort. The Modular WA contracts and design and drafting teams worked closely with the Shire of Wiluna to ensure the homes met the client’s design brief and expectations. To meet the clients strict timeframe requirements all 5 homes were built and transported to site within 12 weeks. Project management on site in Wiluna was critical to the overall success of the project and Modular WA engaged the services of an experienced and well equipped local contractor to ensure the onsite installation process was completed on time and to a very high standard of workmanship. Dampier Bunbury Pipeline (DBP) is the operator of the privately owned Dampier to Bunbury Natural Gas Pipeline, Western Australia’s most important piece of energy infrastructure. Due to recent growth, the company required a new administration office to accommodate its expanding workforce. Demolition of existing building, construct and installation of additional administration office building including transport, onsite earthworks, and module join up. The office features an open plan space with raking ceiling encouraging a collaborative working environment. Additionally, the building contains three enclosed private offices with noise isolation batts, a purpose built utilities room and universal access facilitated entry. Modular WA provided an economical solution by decommissioning the existing unit and replacing it with a larger purpose-built office. As the modules were constructed offsite and transported to Jandakot, this eliminated downtime for personnel and minimised disruption to surrounding buildings. Modular WA also liaised with Chubb Fire while wiring the smoke and fire alarm systems in order to ensure the building integrated effectively with existing infrastructure. The delivery of the DBP Administration Office project was on time and within budget, demonstrating Modular WA’s ability to provide a quality commercial product tailored to each client’s needs. The City of Busselton is located just over 200km or two hours south of Perth in Western Australia’s South West region. In 2018, Modular WA was successfully awarded the tender for the supply and installation of two holiday cabins for the Busselton Jetty Tourist Park to support the region’s growing demand for tourist accommodation. The project included the design, construction, transportation and site installation of one park cabin, with a second cabin constructed and transported to a storage for installation at a later date. The holiday park cabins featured two bedrooms with built in robes, a bathroom with a generous vanity and open plan living/dining/kitchen area that extends out onto the front verandah. All contained within 70m2, the building remains functional and welcoming while making smart use of space. As the cabins were additions to an established tourist park, the Modular WA contracts and drafting team designed the buildings to seamlessly integrate with the pre-existing buildings. Situated on a difficult to navigate site, the Modular WA installation team demonstrated their site management expertise, allowing a smooth and successful install with minimal removal of the client’s peppermint trees. Overall the cabins were completed to a very high standard of workmanship that exceeded the client’s expectations.